Blocked nose. Information on the causes, symptoms and treatment of a blocked nose. A blocked nose is a common symptom associated with viral infections such as the common cold or the flu. They occur as a result of our mucous membranes becoming inflamed and they can be eased using a variety of home and herbal remedies. 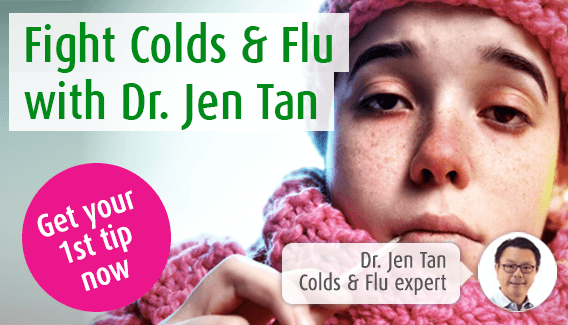 Here at A.Vogel Talks Blocked Nose our immune system expert Dr. Jen Tan explores the causes and symptoms of blocked noses, and provides an array of natural solutions to alleviate nasal congestion. There's also a Q&A service where you can get answers to all your questions. An important function of the nose is to purify inhaled air. The nasal passageways are lined with tissue known as a mucous membrane - this produces a slimy secretion (mucus) with the purpose of keeping the nasal passages moist. Fine vibrating hairs called cilia are present whose function is to trap dirt particles entering the nose. They clean around 10,000 litres of inhaled air a day and minimise the amount of inhaled bacteria. This is why it’s important to breathe through your nose as much as possible. There’s no mistaking that bunged up feeling that so often accompanies a cold, when your head feels as if it is ready to burst. The nasal passages are lined with mucous membranes that produce a slimy secretion (mucous) to keep the passageways moist and to help stop bugs and dirt from entering the nose. A blocked nose or nasal congestion is when you wake up with catarrh dripping down the back of your throat, you find it difficult to breathe quietly, you are unable to exercise without struggling for breath and you feel as if you are always clearing your throat. Treatment is usually in the form of nasal decongestant sprays that are sprayed directly into the nostrils. Sinuforce Nasal Spray is a herbal remedy with menthol which can be used for the rapid relief of a blocked or congested nose. It reduces swelling of the nasal mucous membrane, without affecting its natural protective function. "This product really helped me with a stuffy blocked nose, it cleared my nose straight away brilliant." The 100% natural ingredients soothe the nasal mucous membrane. It also contains peppermint and eucalyptus oil to ease breathing and chamomile oil that has a soothing effect on the nose. Most colds cause a stuffy or ‘bunged up’ nose which clears quite quickly. However, if the sinuses do become inflamed, other symptoms can develop such as a throbbing pain and pressure in the face, which is made worse by bending forwards.This is known as sinusitis, a common condition affecting 30% of the population at some time. If you're suffering from a blocked nose then you may benefit from trying out Sinuforce Nasal Spray. This product contains menthol and brings relief from nasal catarrh, a blocked nose and congestion. To find independent stores in your area that sell Sinuforce Nasal Spray Blocked Nose remedy, simply type your postcode below. Should I stay clear of sport when suffering from a blocked nose? Can what you eat and drink affect your blocked noseBlocked noseConstant blocked noseWhat's causing my blocked nose at night?Case study: all blocked up?Oh no it's snot!8 simple ways to ease a blocked noseHow do you clear a stuffy nose fast? What can I do to unblock my nose? How can I clear my blocked nose? Are there foods that I should eat/not eat? As the A. Vogel Immune System expert, I recommend Sinuforce Nasal Spray with menthol, to help ease symptoms of a blocked nose. Pregnancy can make you more susceptible to a blocked nose. Hormonal changes can cause the delicate tissues of your nose to become inflamed, restricting the flow of air and causing you to experience a blocked nose. What&#39;s causing my blocked nose at night?